Grape expectations for Alex Van Driel OF CLOVER HILL. PRINCESS Mary had Clover Hill wines at her Danish wedding. Queen Elizabeth — on her most recent visit to Australia — enjoyed a Clover Hill sparkling at Melbourne’s Government House. So it was fitting that this year the Royal Agricultural Society of Tasmania awarded Clover Hill Tea Tree the Tasmania’s Vineyard of the Year, a competition where entrants are required to outline production aims and are judged on all aspects of management. In recognising Clover Hill’s vineyard manager Alex Van Driel, the judges commented that despite an extremely dry season and problems with restricted irrigation water, the vineyard produced an increased yield of premium-quality, disease-free fruit. Alex, 57, who has been with Clover Hill for eight years, said the award provided reassurance after years of overhauling viticulture management. “When I came to Tea Tree there was no equipment or infrastructure, no sheds or power, and the irrigation needed to be hooked up to mains power,” he said. 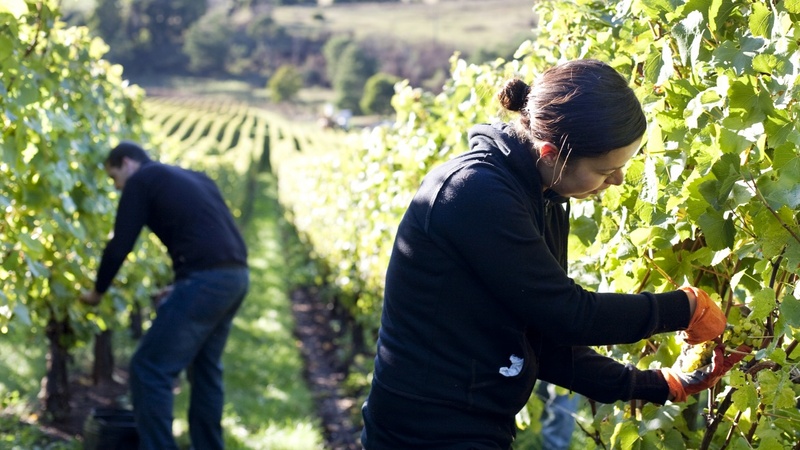 CLOVER Hill has two properties in Tasmania, both of which are managed by Alex, growing mainly pinot noir and chardonnay. The 30-year-old Pipers River property is in the north of the state, with 22ha under vine. A $1 million cellar door is currently under construction and will open in December. The Tea Tree property is in the south with 16ha under vine. It was purchased in 2000 and vines planted in 2008. Both properties are owned by Goelet Wines Estate, which also owns Taltarni in the Victorian Pyrenees region. Grapes from both Tasmanian properties are made into a base wine at Pipers River winery and then shipped to Taltarni where the Clover Hill label is made into sparkling wines, using traditional French methodology, with some base wine also used under the Taltarni label. Clover Hill produces a total of 10,000 cases of wine a year. he average yield from Pipers River is usually 160 tonnes a year but this year that increased to 215 tonnes. The Tea Tree property also had a higher yield — usually it averages 86 tonnes a year off 12ha but this year that increased to 107 tonnes. These increases come despite a dry season and reduced irrigation entitlements, which underscores Alex’s skilled management. THE Tea Tree property has an average annual rainfall of 450mm but last year that was 295mm, the lowest in a decade. To make matters worse, the past year’s irrigation entitlement at Tea Tree has been severely reduced. Usually they access 52 megalitres but this was sliced to just one megaliture a week, while their on-farm 52-megalitre dam lost almost a megalitre a week through evaporation. Alex said this required careful management, including slashing grass so it mulched under vines. “We have learnt with sparkling grapes to irrigate twice a week and only for four hours to maintain soil moisture and prevent soil cracking around vine roots,” he said, adding that in contrast Pipers River was not irrigated and received an annual average rainfall of 1200mm. The increased yields also came as a result of warmer weather during flowering, and perfectly timed rain, which made the berry more even, more abundant and heavier. Alex said the two Clover Hill vineyards were 300km apart and were different in more ways than simply climate and water availability. THE Goelets originally bought Pipers River three decades ago because the high rainfall cool climate was similar to France’s Champagne region and they could see the potential to grow grapes for sparkling wines. They bought Tea Tree — a former scrubby sheep paddock — in 2000 as a production vineyard, because, being drier, there was less disease pressure, with straight rows making it adaptable to machinery. Alex said when he arrived at Tea Tree in 2008 the vines were planted but there was little else on the vineyard and he has since implemented an array of management changes. Soil has been a key focus. Unlike Pipers River, which has rich red, well drained volcanic soil, Tea Tree has black cracking clay — “cracking up to a metre in summer” — that sticks when wet and is high in magnesium. To improve the soil, which is tested annually, Alex has ­applied 30 tonnes of composted cow manure and, since 2014, two tonnes of gypsum a year and uses fertigation in spring, and summer if required. IN 2008 and ’09, ryecorn was planted in every second row, which was rolled into the soil (leaving the roots alive and squashing the grass). This created a mulch bed that kept the soil cooler and acted as a weed suppressant and eventually added to the soil’s organic matter. In recent years fescue has been grown in every second row of the chardonnay block as a trial, which is now used widely. Alex said the fescue stabilises and binds Tea Tree’s cracking soil, prevents the soil from being sticky and acts as a weed suppressant. Ultimately it ends up as mulch when slashed under vine and because fescue is not slashed as often as other grass species, they have reduced diesel fuel costs in the chardonnay block by about $500 annually and herbicide use has reduced. “We’re still working at it and will continue,” said Alex, who works with a staff of four ­between both properties, as well as using casual workers and contractors. “The soil is healthier and we have better worm activity. My overall philosophy is if you take something out of the system you’ve got to put something back into it. “If you don’t look after the soil your plants eventually decline and the soil becomes infertile. WITH such attention to detail, it’s not surprising Alex keeps meticulous records on inputs, vine growth and seasons, which helps to maximise budget efficiencies as well as vine management and harvest. Harvest is usually in March and April but this year was two weeks earlier and last year was two weeks earlier again.